I bought Brother MFC-240C yesterday for using in my home. My home network is windows network that use the same workgroup name to see each other. The printer is connected to mom's pc. 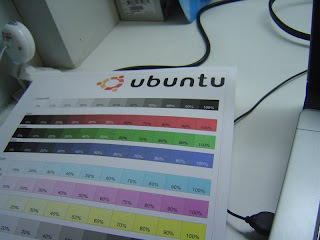 Then I will add this printer to my ubuntu but the ubuntu database have no drive for this model. After I googling a few minutes, I found this page and this page. These are the answer! 3. double clicks the LPR driver (mfc240clpr-1.0.0-9.i386.deb) to install. if you plugs the printer on this computer(via USB). It's can work now. Click the Change button on the "Device URI" line. and Find out where your printers!. 7. Try printing the test page and see what you've done. From the picture above, one thing I can tell about Ubuntu's test page is that it does consume lots of ink o__OBTW, MS Operating system is spelled "Windows", not "window"
great job, thanks for the article. I've been looking for this solution for over a year now cheers. It's like you read my mind! You seem to know a lot about this, like you wrote the book in it or something. I think that you could do with some pics to drive the message home a little bit, but instead of that, this is magnificent blog. A great read. I will definitely be back. Blog here: How To Password Protect Folder.